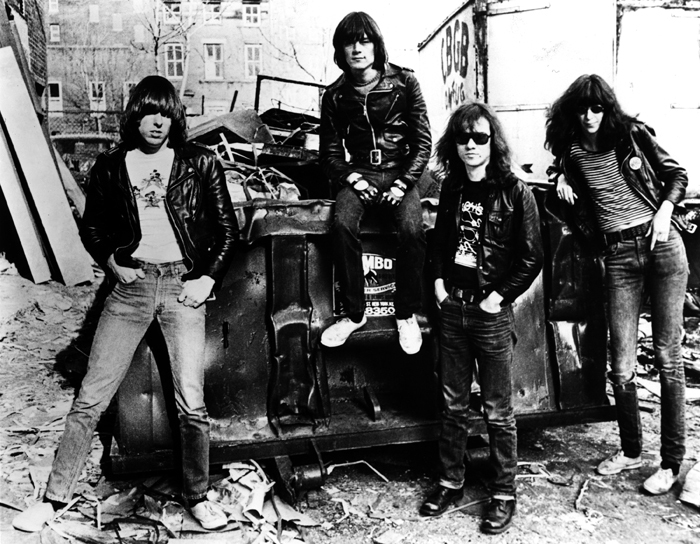 Shepard Fairey, (left to right) Dee Dee Ramone, Tommy Ramone, Joey Ramone, and Johnny Ramone, 2016. Courtesy the artist / OBEY Giant, Inc.
After many years of preparation, “Hey! Ho! Let’s Go! Ramones and the Birth of Punk“will be opening this Sunday, April 10th at the Queens Museum. This multi-media exhibition not only tells the story of the Ramones, but also puts special emphasis on the explosion of visual art that surrounded the rise of New York punk from the 1970s through today. The exhibition features over 350 pieces of art, photography, ephemera, memorabilia, and video. Danny Fields, Ramones behind CBGB, 1977. The exhibition is book-ended by a group of paintings made specially in honor of the Ramones’ 40th anniversary. Yoshitomo Nara’s large billboard painting welcomes visitors with a big “Hey! Ho! Let’s Go!“, while Shepard Fairey concludes the exhibition with brand new portrait paintings of the four founding Ramones (see above). Another new piece done specially for the exhibition is a cartoon map of the Ramones in New York City, drawn by Punk magazine co-founder John Holmstrom, which will be given away free to visitors. 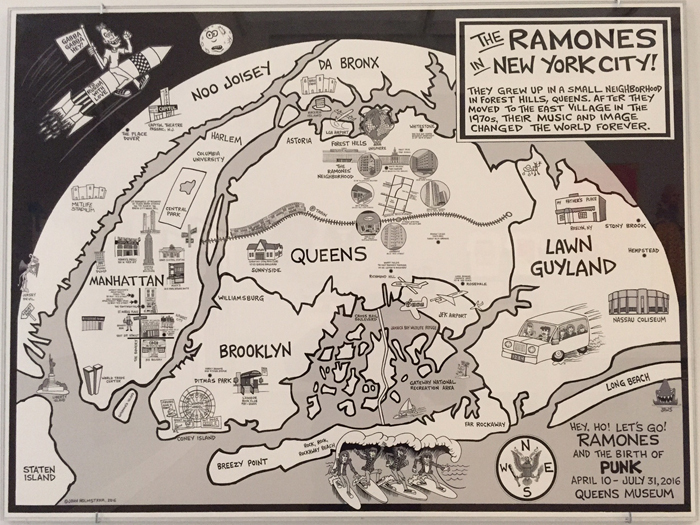 The map features the childhood homes of the Ramones and their associates, as well as the clubs, shops, and beaches where they hung out. Among the other artists represented are: Sergio Aragonés, Bob Gruen, Roberta Bayley, Fly-O, Curt Hoppe, Arturo Vega, Keith Green, Matt Groening, Jenny Lens, George Seminara, Charles Burns, George DuBose, Stephen Kroninger, Mick Rock, Joey Ramone, Dee Dee Ramone, Paul Kostabi, Bettie Ringma, Haoyan of America, Richard Hambleton, Mark Kostabi, Godlis, and Danny Fields. Special thanks to Mickey Leigh and Linda Ramone. The exhibition is co-curated by Gallery 98’s Marc H. Miller. All are welcome this Sunday from 4 to 8 pm. Check out the Queens Museum website for more information and directions to the museum. Shuttles will be running Sunday afternoon between the museum and the 7 train station at Mets–Willets Point. John Holmstrom, The Ramones in New York City! 2016.